Victorian technology has no business being the receptacle for your business. It’s time to outmode the common commode. From the gong farmers of Tudor England, to the night-soil collectors of early 20th-century China, to the porcelain gods prayed to daily throughout the modern Western world, the indelicate matter of bodily waste disposal has been marked by a common philosophy: Out of sight, out of mind. And in the view of architect, writer, and environmental evangelist Jason F. McLennan, that really stinks. "For the last 100 years, we’ve basically done everything wrong. The toilet is simply a receptacle on one end of a huge chain of stupidity created in a misguided effort to protect the public from disease and embarrassment," he explains. "By using water to convey waste over long distances to industrial treatment facilities, we’ve committed two great environmental sins. One, we’ve polluted our water supply: Huge amounts of energy and toxic chemicals are required to make it clean again. Two, we’ve become the only species on Earth that disrupts nature’s nutrient cycle because we destroy those found in our waste. An entire industry has arisen just to replace them." nutrient-preserving composting toilet is undoubtedly the Holy Grail. 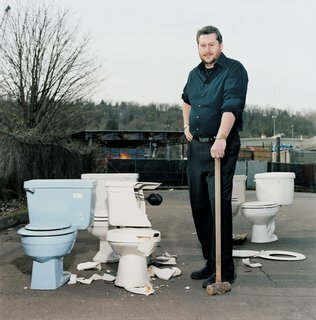 It was McLennan’s passion for the topic—–and his email handle of "Green Warrior"—–that led us to enlist his expertise in reviewing a variety of eco-toilet contenders poised to usurp the single-flush throne.